Makes one 30cm / 12" cake. Preheat the oven to 180 degrees C/ 350 Fahrenheit / gas mark 4. You will need 1 x 30cm (12 inch) cake tin or spring form mould, lightly oiled. Cream the butter and sugar together until light and fluffy. Gradually add the eggs to the creamed mixture, beating well between each addition. Sift the spices, a little salt, flour and baking powder together; fold into the creamed cake mixture. Stir in the carrots, lemon zest and juice and ground almonds. Put the mixture into the prepared cake tin and spread flat with a knife. Bake for 1 hour, or until cooked; a skewer inserted into the centre of the cake will come out clean when the cake is ready. Remove the cake from the oven and leave to cool for 5 minutes. Loosen from the tin and lift onto a wire rack. Allow the cake to cool completely. Sift the icing sugar. Then put the cream cheese and icing sugar into a bowl and stir together until well combined. Add the orange zest and some of the juice to taste. 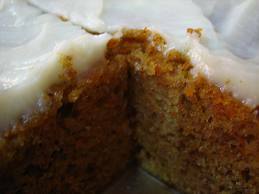 Be careful not to add too much juice as the icing will become too liquid. Spread it over the top of the cake and sprinkle the top with chopped walnuts. 10 I've been desperately looking for a 12 inch carrot cake recipe for bottom tier of my daughters wedding cake. Going to try this - wedding not til December so need to get some dummy runs in. 7 you are a reader of my blog, you'll know that I love my rpceie for Cream Cheese Icing. And, this mix comes with Cream Cheese icing too. How does it fare when compared to my own rpceie? 10 So easy to make & tastes great! 7 made this now!!! i only added lemon juice....but i will make it this way on sunday for my sweet tooth friend!!!!! 7 Yeah it's good, but some bits aren't that clear. Forget about the stupid carrot cakes! Who likes Spongebob? 8 Am I to presume the 3 3/5 carrots are to be shredded or cut in small cubes? How about the orange? Again, presume it needs to be cut and juice remove but how about the pulp? 10 Looks sooo delicious. Thanks, I will definitely try this tomorrow. 10 does this recipe acthully work? 10 The instructions were very clear & my cake turned out perfect. Though no-one liked the topping so I'll have to use butter cream or orange icing next time. 10 Im jus starting an dis is looking awsome!!!!!!!!!!! 10 what if we don't have icing sugar and we are unable to by it? Is it ok if we could use normal white sugar? 8 this cake is fabo. 10 It gave me food poisoning..I JOKE I JOKE. 5 Whoever posted that the recipe didn't say when to add cinnamon etc.,obviously didn't read it properly-its there as plain as daylight. Lovely cake!! 8 Made this cake today,It is a very good moist cake but beware when making the icng make sure you buy a high quality cream cheese,as i purchased a run of the mill cheese and even before i added any juice to the mixture it became obvious that the mix was far to runnt.I can only imagine this was the poor quality of the cream cheese,So then i had to add even more icing, in turn this made the topping so very sweet and sickly.Overall the cake is good but thought the method of the reciepe was a little shady in information,carrots well i finely grated mine but no information on what you should do with them,I to took the liberty of adding half of the juice of an orange to the mixture,glad i did it adds a little more flavour to the cake to.Would i make this cake again ?? probubly yes but i would find another receipe for the topping to use on it. 9 Very tasty but it does'nt tell u when to add the cinnamon and cardamon.